Weekends and school holidays are all about fun and games, today we have had a Fab playdate with the youngests bestie. 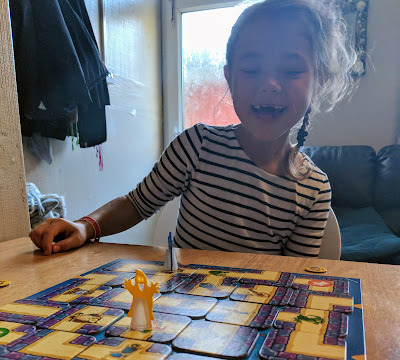 Being the organiser she is the youngest had the day planned out, this including Halloween activities such as pumpkin carving, so I thought with the ghostly playing pieces of the Junior Labyrinth game from Ravensburger we have been sent for review the game would fit perfectly with her spooky Halloween themed day. I really enjoy the girls being this age as they already display lots of independence and understanding for rules, they love to try things for themselves and can understand the need for turn taking and playing by the rules, although do not go as far as being graceful losers yet!! 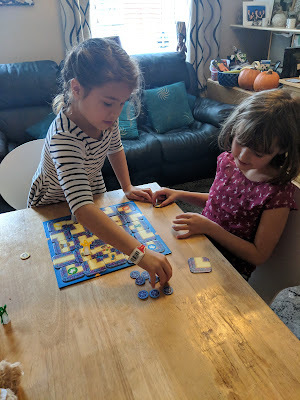 The game was really easy to set up and the girls loved the ghostly playing pieces and easily understood the concept of moving tiles to create pathways to where they wanted to go. It was great that it required them to plan ahead and think of how they needed to move certain tiles to create a pathway using logic and pattern to move ahead. Once the rules were explained they were able to play independently and I am sure next time they will easily set up and play okay with no help at all. 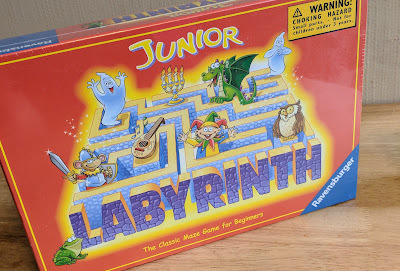 The game consists of a board with 5 tiles attached to it, there are then 17 maze tiles that are randomly placed on the board to create a Labyrinth of pathways, there will be one maze tile left over, Some tiles have objects on them which are also on secret tokens which are placed face down next to the board. Players take it in turns play, the first player is to pick a secret token and look for a pathway to the object on their token. The spare maze tile can be used to move the pathways by inserting it into a row from the end, this then pushes out another tile for the next player to use. If a clear pathway to the object cannot be made then play passes to the next player to find a path to the object on the secret token using the spare maze tile to move the pathways, if a player creates a pathway to the object they keep the secret token, the next player then turns the next secret token. Play ends when all tokens are won and the winner is the player with the most tokens. The quality of the board and tiles is really good and will withstand lots of repetitive play, the ghost play pieces are strong and sturdy so this game is one that will be played over and over again. A great addition to your Halloween games for this half term.